The Team pages are intended to be a one stop overview of all the team’s current activities for players and parents. At a glance users can view the upcoming schedule, team stats, team stat leaders, and current news. Sport NGIN has developed specific tools for these tasks. Obviously, the level and depth of information posted on a Team page may vary for In- House versus Traveling sports. A successful homepage conveys the big picture, without getting into the nitty-gritty details. Think of it as a teaser that helps your visitors quickly browse important content- as they find what they are looking for, they click deeper into the site to learn more. It is important to have a basic layout for each Team page. That ensures the basic information is always available. It also creates continuity throughout the entire site. Then a team manager or coach can be given permission to manage and update the content of the pages during the season. It's now up to you to begin adding content. All of the Page Elements can be accessed from the center of the content panel. Add text, photos, galleries, tables, and more. When you click into each page element there is a brief description about the element and it's functionality. Once you have added content, you can drag and drop the elements to rearrange the layout. There are several other sub-pages attached to the Team page itself. This includes a page for a roster, game schedule, statistics and team standings. These pages give a more detailed look at the information than the home page. As the manager of the team pages, the one thing to remember is a player and parent want to find the information they are looking for quickly and easily. They also want to see new stuff every time they return to the site. So be sure to keep the team pages organized and continually updated. Once you have been given ‘owner’ permissions to your team page, you will then have the ability to edit and manage the team information and page content. A switch will be visible on your team page and any subsequent sub-pages you are an owner of. This switch is located on the top right corner of the site. This switch will only be visible on pages you have permissions for. Once in Edit mode, the page editing options will display. These options are in yellow and are not visible to the general user. A row of tabs appears when in Edit mode. This tab displays all of the content on a page including the Layout Containers and Page Elements. All modifications to the page view is done under this tab. As a page owner, you have the ability to grant Owner or Editing access to other users. This can be done independently for each page. But, for permissions given to a page, they are also given the same permission for any pages under it. Pages can also be set up as Private. This gives you the ability to give permission to specific users to be able to view that page. It can be useful for roster information if the players are minors so only parents can view it or for contact information only to be shared within the team. Groups are a collection or group of players/users that can be emailed collectively. A message can be sent to an entire roster or a portion of it. The emails are sent out as a BCC and in a no-reply format. A set of Team Information links appears on the Team page just below the logo and on all subsequent team pages. These pages display the detailed information for each category. Each page also has a button to create a ‘Widget’ so that the information can be displayed on other pages (details on Widgets is below). This is where a team roster can be created. For every player that is added, a player profile page is created. You will be able to add player information, picture, etc. to these pages as well. This is where to find a complete display of all games. New games can be entered individually. Users can drill down into each game to view the vital information, plus a comment stream can be added so players can leave messages for the entire team. This is an overall display of all team and player statistics for the entire season. These stats are automatically compiled from each game. This displays complete teams standings for the entire division. This is a display of team and individual stats for the season. Team managers are in charge of entering their team and player statistics for the season. Statistics preferences are already set and you'll be able to enter any of those stats you wish to track. Stats are entered for each individual game. Once you have marked a game complete and updated all of the game statistics, your totals will be calculated and posted into the Statistics section within your team page. Also, player’s stats will automatically update the profile pages within the roster. This is easily the most important information you will manage. An analysis of years of website traffic has demonstrated that this is the single most heavily used page on any sports website. 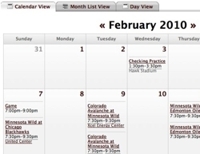 The calendar shows players and parents where all events are happening. Everyone has busy schedules to manage! The events can be anything from fundraisers to practices to team meetings to the games themselves. All events can have a location, start time and even a URL for a Google Maps link so everyone knows how to get there. This provides a seamless ability for player/parents to find the important information of everything that is going on with the team. Users can even integrate these events to their desktop or mobile device using the built-in iCal and RSS feeds! Events are displayed on any page using an Event Aggregator and can also be viewed on the Calendar page in the top navigation. As owner for the team pages, you have the ability to add any additional pages that are needed. With all of the Page Element options available, you have complete control to display a wealth of information. Some of the other Page Elements that will be frequently used are the Text Block, Single Photo, Link and Contact elements. Each of these is intuitive, easy to use, and will make your team pages look great! The most important Page Elements are outlined below. Additional pages can be created at as a sub-page of a page you have ownership of. Then Layout Containers and Page Elements can be added to display all the information and images for your team. Layout Containers are important for visually organizing the information on a page. They hold one or more Page Elements and can have one, two or three columns. Layout Containers are identified by the grey bar surrounding it. Page Elements are each a unique way of displaying the information on a page. They each have a yellow bar at the top. Both Layout Containers and Page Elements can be updated by clicking on the ‘EDIT’ link on the top right corner of each element. They can be moved using drag & drop with a click and hold on the four-way arrow icon and drag it to the proper location. Both can also, in most instances, be copied or moved to another page that you have Ownership permission for. A very important element is a Widget. A Widget is a specific collection of data from Teams/Leagues that can be displayed anywhere on the website and automatically updates. The best part is the data in the Widget is continually updated as current game stats are entered. There are several different types of Widgets that display different information. 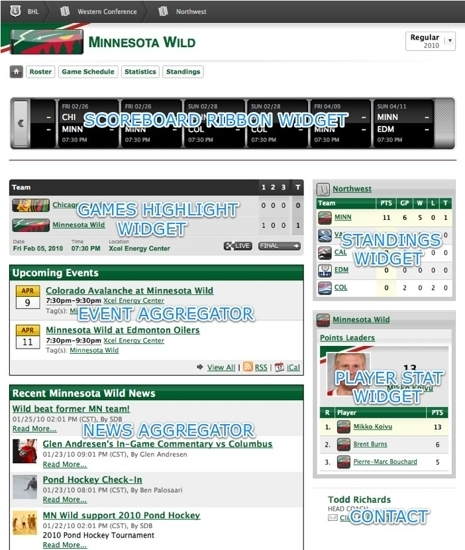 A Widget can be created from the any of the Team Information pages (Roster, Game Schedule, Statistics, Standings) that are displayed at the top of the Team page. Click on the 'Create Widgets' button. Many of the Widgets will allow you to select specific display formats and what information to display. 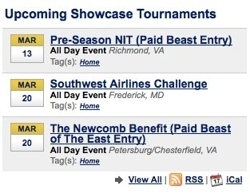 An Event Aggregator displays a preview list of the most recent upcoming events. Its flexibility allows events to be displayed which are only pertinent to the page the aggregator is on, based on a tag system (see below). An event or game can be displayed on multiple pages at the same time and even allow a single aggregator to display events that are relevant to several segments within the organization. This is the way to manage events because it automatically features the most recent upcoming events in two different formats: Five Day View or Upcoming Event List. At the same time, events that have taken place are still available. Two types of events can be added: Non-Games and Games. Practices, Fundraisers, Team Parties, Meetings, etc. can be added directly from the Event Aggregator on your webpage. Click on "Add Event" and insert details, including date, time, and location. This is the ideal solution for managing events because it automatically features the most recent upcoming events in two different formats: Five Day View or Upcoming Event List. At the same time, events that have take place are still available. A News Aggregator displays a preview list of the most current News Articles. Its flexibility allows News Articles to be displayed which are only pertinent to the page the aggregator is on, based on a tag system (see below). A News Article can be displayed on multiple pages at the same time and even allow a single aggregator to display articles that are relevant to several segments within the organization. Visitors can click on the listing to view all the event details. A News Slideshow functions exactly the same as a News Aggregator. The difference is in the display. The Slideshow’s prominent feature is a large image along with the headline and teaser text. There are several different transitions types or fades that can be used when cycling from image to image. Visitors can click on the headline to view the full article. 'Temporary Importance' content would be an article about the upcoming High School Coaches Fall Clinic (which is important this week, but may not be important this winter), or an article highlighting last night's game. 'Permanent Importance' content would be a page devoted to your organization's sponsors or a team's roster. This is the ideal solution for managing information. It's crucial to get into the habit of posting information of 'Temporary Importance' as News Articles. This will automatically organize your content based on the date of the article. As other 'Temporary Importance' News Articles are added to your site, older content will automatically be organized lower on the list. This will help to keep content fresh and relevant at the same time making old articles available for future reference. Click on Add Article at the top of the News Aggregator to create new article. Always include a photo with your article. This will have a huge impact on the visual strength of the pages. Tags are the mechanism by which News Articles or Events may be associated with a corresponding Aggregator (the News Slideshow is an aggregator). These work the same for News Articles as they do with Events. An aggregator and article/event both must corresponding tags associated in order for the article/event to display. This system allows the same article/event to be displayed on multiple pages. A News Aggregator is on the home page and has the Tag ‘Home’ selected. Another News Aggregator is on the Men’s Gold page with the tag of ‘Men’s Gold’ selected. A third News Aggregator is on the Women’s Silver page with the tag of ‘Women’s Silver’ selected. A News Article is created announcing the winner of a Men’s Gold tournament. That article will have the tags ‘Home’ and ‘Men’s Gold’ selected. This article will then be displayed in the News Aggregators on the Home page and the Men’s Gold page. It will not display on the Women’s Silver page. Bottom line: Lose the clutter! Using News and Event Aggregators there is no clean up of old information! They will save the time of removing old content from a page. (provided you remember what page you put it on!) Aggregators will also keep the look of your website clean and organized. Plus, the information is not deleted so it can be referred to in the future. It will take some planning and persistence to have a successful team page. Layout a structure of what information is going on what pages. It is a lot easier to create the website if you know where everything is supposed to go. It is no different than organizing anything else. All the stuff must have a home. But it should be fun! Don’t limit yourself to just games! Ask others to contribute. Include a link for anyone to send in photos and stories that can be added to the site. Create an article about the most superstitious player on the team. Document the road trip to a tournament and share it. Have players write articles to get a different sense of the team. It’s amazing how rich a site can be with content from many different perspectives! The NGIN team is here it assist you along the way. Go to our knowledgebase for questions or contact our support team directly for additional help.